My son (6) is Bakugan-crazy. 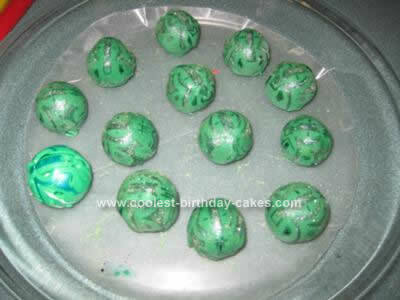 So I searched the web for a Homemade Bakugan Birthday Cake idea and saw many on your site. I decided to get to work creating my own and I think it is pretty awesome. 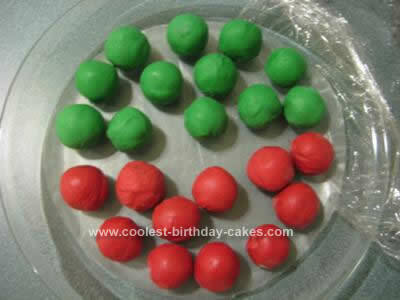 I started by creating the Bakugan balls: Jumbo Malted Milk Balls dipped into red & green Wilton Candy Melts. I decorated them with icing paint pens & Wilton shimmery dust. 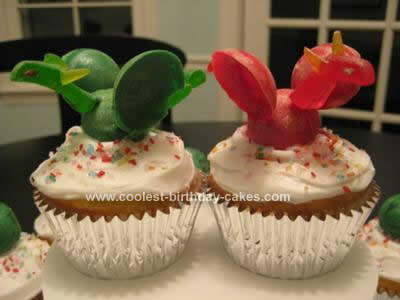 I placed a “closed” Bakugan on top of each cupcake I frosted with plain white icing & colored sprinkles. Now for the fun part… “OPENED” Bakugan centerpiece. I again used dipped malted milk balls as the base/body. I then cut up DOTS candy and stuck them onto toothpicks to create the head, neck & tail… added cut up DOTS pieces for the horns, eyes and feet (ended up not using the feet in the final piece). Experimented with several different candy types before deciding on DOTS as they were the most “sticky” and yet held their shape after being cut/sculpted like I wanted. Skewered the toothpick appendages into the body piece and added more Wilton shimmery dust for detail. THE HARD PART… WINGS!! After a flop or two, ended up using my Wilton Candy Melts melting tray as a mold for the wings! Popped them out when cooled and attached them to the body with a small glob of the melts mixture. Assembly was easy: placed closed Bakugan cupcakes around bottom of a cake carrier; The centerpiece Bakugans cupcakes are elevated onto an inverted bowl with a small, stiff paper-plate taped on top. Added extra balls around/in-between and then the finishing touch… my homemade “Happy Birthday” GATE CARDS (Bakugan fans will know what these are) I made on my computer. I am very proud of my creation and I think it’s a birthday my son will never forget… or at least I have the photos to show him if he does. The only problem is… how do I top this NEXT year??? Happy baking & decorating, moms! This looks sooo easy to do! The other recipes I just read seems complicated but I think I can do this one…. 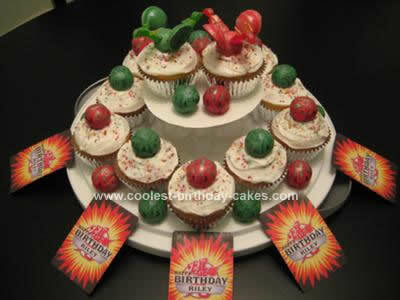 My son is turning 7 next month and he wants a Bakugan cake. I think i will try this! Thanks!